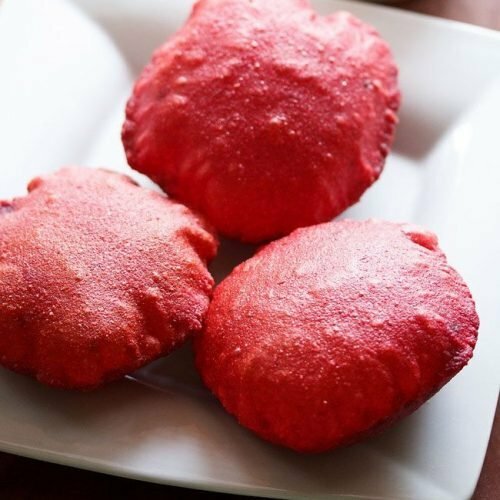 beetroot poori recipe is a crisp crimson coloured poori made with beetroot, whole wheat flour and some spices. rinse, peel and roughly chop 1 large beetroot (180 grams). add the chopped beetroot in a grinder or blender jar. next add ½ teaspoon fennel seeds, ½ teaspoon chopped ginger and 1 teaspoon sugar (optional). without adding any water, grind to a smooth puree. take 2 cups whole wheat flour, 2 tablespoons fine sooji (rava or cream of wheat) and ½ teaspoon salt in a mixing bowl or pan. add the beetroot puree. scrape of all the sides and the bottom of the grinder jar and add the puree to the whole wheat flour. or else you can rinse the jar with little water. then add 1 to 3 tablespoons of this water to the flour. also add 1 teaspoon oil. add very less water after you mix with beetroot puree. add water carefully as then the dough becomes sticky. if the dough looks very sticky, then add some flour and knead again. mix and knead to a soft smooth dough. in case the dough becomes sticky, then add some more flour. cover and let the dough rest for 30 minutes. after 30 minutes, divide the dough in small or medium sized balls. roll them into neat round balls. take one dough ball. flatten it and spread some oil on it. now gently roll to a 4 to 5 inches poori. roll to pooris which are neither thick nor thin. heat oil in a pan or kadai. check the oil temperature by adding a tiny piece of dough in it. if it comes steadily and gradually on top, the oil is medium hot and ready for the pooris to be fried. gently slid one beetroot poori in the medium hot oil. nudge with a slotted spoon, so that the beetroot poori puffs up while frying. fry till the oil stops sizzling. then with the slotted spoon, gently turn over and fry the other side of the poori. fry beetroot poori till the oil stops sizzling. if you want you can turn over the poori once or twice more. remove beetroot poori with the slotted spoon and place on kitchen paper towels to remove excess oil. prepare remaining pooris in the same way. serve beetroot poori with aloo sabzi or chana masala or any veg gravy or curry of your choice. you can skip rava or sooji if you want. but then add no water or very less water. you can make the pooris spiced by adding some green chilies or red chili powder and garam masala powder. you can also make sweet pooris for kids. just add a pinch of salt and increase the amount of sugar in the dough. skip ginger. fennel seeds can be added for sweet pooris.